Several people have enthusiastically recommended Gimlet's new Mystery Show podcast. I'm not a big fan of mysteries, but for those who are here's a link. Podcasts are finallly becoming popular as a few great storytelling shows see success. The amount of investment money is small - much of it is through Kickstarter these days - but it is real growth. The New York Times on efforts by PRX. Public radio is changing. the first segment is a Christmas Eve tradition since 1979 - a reading of "The Shepherd"
Two regular readers wrote asking for more details on using radio scatter to "listen" to meteor tracks - something I do when it is too cloudy or light polluted to watch a meteor shower. Radio waves travel in straight lines - the reason why we sometimes have communications that are not line of sight is mostly due to reflection. This is really important for long range radio communication. It turns out there are ionization layers from about fifty to a few hundred miles above the Earth. There is a very small amount of atmosphere at those altitudes and UV and higher energy radiation from the Sun is enough to knock off an electron or two from these molecules. The negative electrons want to reattach to a positively changed atom, but the distance between the two is now so great that it can take quite awhile. The net result, when there is a lot of energy being dumped into the layer - is that a plasma forms. This makes a nifty mirror. A lot of physics is involved and depending on the nature of the gases available, their density and how they are energized, the reflection and absorption properties of these layers strongly depends on the wavelength of a radio signal that is pointed at them. Longer wavelengths - AM and shortwave radio - tend to have strong and useful effects. You probably have noticed that you can listen to an AM radio station well over the horizon - even thousands of miles away - when the Sun goes down. Shortwave radio DX - the practice of "working" distant sites - uses this in what can be a very sophisticated way. In the 20s when Bell Labs was doing very careful radio propagation measurements, it was noticed bursts of distant signals sometimes appeared during meteor showers. It turns out that a meteor dumps a lot of energy into the atmosphere that slows it down. The closing speed of the average Perseid meteor is about 37 miles per second and they last about a second - so almost all of their energy is dissipated in a very small cylinder of atmosphere about 40 miles long and 80 to 100 miles up. Electrons from this gas are stripped and it takes seconds for them to recombine. For certain radio frequencies this makes a nifty reflector. If the reflector is between me and a radio station (30 to 50 MHz is nearly ideal it turns out, but FM radio -- about 100 MHz - isn't bad either) that is over the horizon it is possible for me to me to receive it for a few seconds. I've been fascinated with very low data rate communications for a long time and this makes sense for some people. One project that has been rolling along for about 40 years is SNOTEL, which gives daily (and better) snow and precipitation information for the Western US and Alaska. It would have been far too expensive to rely on satellites or conventional ground based networks. Really nifty! The summer is over, and so is our hiatus. The Open Source conversation is reborn at the Watson Institute at Brown University. Please check in on what we've been up to at http://www.radioopensource.org . Thomas Watson of IBM fame, who'd been Jimmy Carter's ambassador to Moscow, founded the Institute in 1981 to address the most urgent global risks of that day: nuclear hazards of the Cold War. Today the mission of the Watson Institute encompasses poverty, hunger, war and culture. My fellowship here commits me to keep exploring and innovating in the interactive new media - at the intersection of pod- and broad- casting where the new discourse of a global age is taking shape. Brown and Watson overflow with blessings for Open Source, starting with the brilliant Rafael Vinoly building that both nestles and goads us to think anew. Nikita Khrushchev's son Sergei is upstairs writing, as is the exiled Zimbabwean novelist Chenjeria Hove, and former presidents Ricardo Lagos Escobar of Chile and Fernando Henrique Cardoso of Brazil. Geoffrey Kirkman of the Watson Institute was right when he told me years ago: the same swath of visiting stars that pass through New York and Harvard come also to Brown, but here they stay longer and they talk more. Brown students keep knocking on my door - this new rainbow generation of "millennials," most of them with digital media skills and native confidence in the expanding universe of the Web. Not least, my Watson fellowship and the combination of avid Brown students and first-class recording facilities have let us cut radically into the "nut" cost of producing Open Source. So, not for the first time in human history, adversity has forced us into a precious opportunity to get lean, cheap and experimental again. "An American conversation with global attitude" could be the motto of the revived Open Source. As always, we need your partnership here to locate the topics, guests and angles that will keep it richly distinctive. All we want to be, as we keep growing up, is - as many of you suggested, and producer Mary McGrath distilled the message - "the best damn podcast" on your computer or your Nano. But how long should the conversation run? And how often? What new features do you want on the site? How do we keep it making it more interactive with "the people formerly known as the audience" and with the world beyond our shores? What we learned in two years on the last round is that "open source" works as well for public conversation as well as it works for advancing software. We announced a "conspiracy of the curious," and people joined it - with an unending flow of show suggestions and witty, critical, often impassioned extensions of the on-air conversation. We learned also that podcasting works. The proto-blogger Dave Winer and I claim together to have done the first podcast in human history just a little more than four years ago. Between us, at Harvard's Berkman Center, we were the Neil Armstrong of the podcast moon, and now everyone's going there. For good reason. Podcasting is the cheap, democratic, speedy, listener-friendly universal means of sharing and archiving original sound files of every kind. Can we keep it new, or newish? To begin, we've fired up the podcast feed of our summer gab which went from the Oscar Wao novelist Junot Diaz to the late John Coltrane, from the cyber prophet William Gibson to the unheeded prophets of our quagmire in Iraq. And there is tasty talk ahead with another of the "global" novelists, Ha Jin, on his first fiction set in America - with "The War" documentarian Ken Burns, and with the canonical critic Harold Bloom at Yale, among many others. Let us end by saying again: Thank you. We couldn't and wouldn't be embarking in these Open Source conversations without the community of you -- that is, without the yeasty, resilient, generous, hungry, faithful, world-wide community that built and sustained Open Source from the beginning. As always, coming and going, Emerson speaks to a great deal of what we're feeling. This comes from the end of his marvelous essay "Circles." "Nothing is secure but life, transition, the energizing spirit. No love can be bound by oath or covenant to secure it against a higher love. No truth so sublime but it may be trivial to-morrow in the light of new thoughts. People wish to be settled; only as far as they are unsettled is there any hope for them." Thank you for passionate, engaged, listenership and commentary these last two years. Now let us all together keep this "community of the curious" alive and growing. So send us your news, your dreams and expectations, please, for the next ride on Open Source and reload your podcast here: http://www.radioopensource.org . Are you aware that you can subscribe (free) to the Open Source Podcast at the iTunes store? Go to iTunes, then the store, enter "open source podcast" in the search box, and then click on the Open Source icon and "subscribe" to get every episode. In the spirit of Emerson: Onward, ever onward! generally great discussion ... the website and, of course, you can subscribe to the podcast. Roger notes a fascinating piece with Michael Desch on our unaccountable political system. 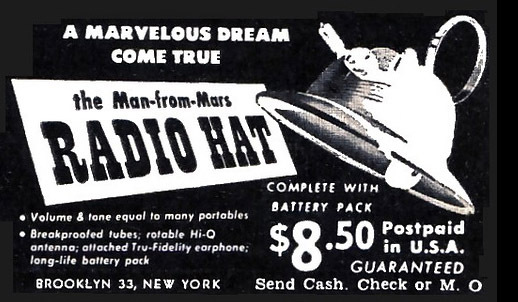 An strange hat from the late 40s. With tubes it would be self heating in the Winter. Tools exist to make stop-motion animation fairly easy ... at least some of the technical aspects of the sport. We've mentioned iStopMotion for OS X. I used it for a small project shortly after getting an iSight camera for my Mac. I tried a few tests with the current version yesterday and can report it is greatly improved. A friend spends about half his time at a remote company location. The place has become very boring to him and he decided to make stop motion videos using his PowerBook, iSight and iStopMotion. He has a plywood board that is used as a stage, mounted lights and a camera mount that slides around the board. Some of his work is remarkable ... not at the level of Aardman Studios, but much better than Gumby. A great tool for being creative and learning the ropes of something that few do. If you become skilled there are higher end versions to support dSLRs. This article has been widely circulated ... basically commercial radio isn't growing (at least ad revenues - real listened minutes are shrinking in many segments). The profit margins are still remarkable - something like 45% of revenus. The executives at Viacom probably feel this sort of margin has been established by god. It is very similar to the chats we had with the record majors in the late 90s .. sky high margins and that was justified by the "value" provided to the customers. I'm sure much of satellite radio's allure is related to programming. Most of commercial radio is a wasteland and the big conglomerates, out of greed and a misunderstanding of their consumers, merely cloned stations to cut costs. Most of the players must be tooling podcasting strategies - even if it means discounting the possibility of a service. Barriers to entry and transmission costs are small compared to satellite or fm radio, so there should be real choice for consumers. I'm betting the early winning players will be satellite radio (it would be easy for them to offer podcasts of their shows on the net) and NPR. Apple probably has some interesting ideas, but I can't imagine direct programming from them - one can imagine updates to iTunes to make this very easy - it will be a way for them to extend their lock on the market (aacplus seems make for the purpose with regular aac for higher quality when necessary). The big commercial radio networks are probably in denial - they probably can't figure out how to get 45% margins from the business. Putting together interesting radio programs takes real effort and some talent. There may be some long tail effect, but the middle part of the tail is going to be much more interesting. In the meantime, strap in for an interesting ride as Wall Street realizes PORS networks have grossly inflated valuations. Greg pointed out a wonderful This American Life piece (real audio). Listen to the whole show as it will give you a sense of how the pros make it seem effortless. The Superman episode is wonderful and qualifies as art. You can (and probably should) create family interviews and, with the surging interesting in podcasting, it might be fun to offer a real program. Here are some high level recommendations. Lots of people use mini discs, lots of people use DAT. A few of the hard disk mp3 players have audio in, but most of them would need a good (adjustable) preamp and a monitor out to be useful. A more entertaining and thorough guide is available through TAL in comicbook format. Outstanding and recommended. It is much cheaper than video and can be easily as creative.